Are you new to homeschooling? Are you homeschooling a child with special needs and don’t know where to begin? If so, we have some great news for you. 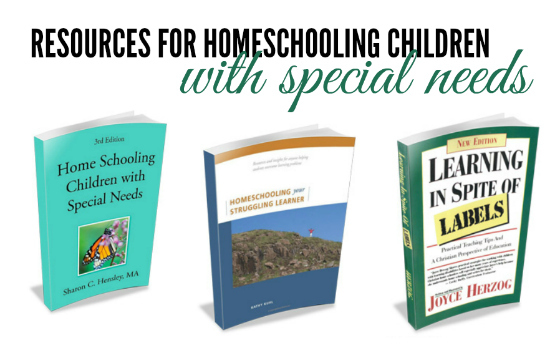 The HSLDA online bookstore is now carrying titles related to homeschooling children with special needs. As an HSLDA member, you can receive a discounted price on all of your purchases. Today, we’d like to introduce you to three of the books that are now available in our online store. 1. Home Schooling Children with Special Needs by Sharon Hensley; The HSLDA Special Needs consultants consider this book to be one of the top picks or “go to” resources! Sharon, not only holds a Masters Degree in Special Education, but she has walked the journey—having homeschooled her own daughter, Alison, who is on the Autism spectrum. This book offers practical help, answers, direction, curricula suggestions, a sample student education plan and template, as well as encouragement. This book is a must have on your homeschooling teacher resource bookshelf, particularly if you are new to homeschooling a child with special needs. 2. Homeschooling Your Struggling Learner by Kathy Kuhl; This book is a packed resource guide and a wonderful tool for anyone who is either new to homeschooling , homeschooling a struggling learner, or even a veteran homeschooling parent who has a child with special needs. Common learning problems are discussed and practical resources provided. Kathy offers comments and insight from over 60 families she interviewed, as well as her own experience having homeschooled her struggling learner from grades 4-12. In addition to information about evaluations and diagnosis of learning difficulties, information on therapies, treatments, types of professionals, and ideas for teaching, creating, and adapting materials at home are shared in this valuable resource book. 3. Learning In Spite of Labels: Practical Teaching Tips and Christian Perspective of Education by Dr. Joyce Herzog; in this practical and easy to read book, Joyce draws from her over 25 years of experience working with students with special needs and offers insightful ways to help them overcome labels; Joyce gives parents help and hope as they seek to help their children reach their full, God-given potential regardless of the labels they may wear. Joyce also helps parents to understand what it feels like to be learning disabled, where to begin with homeschooling a child with special needs, and instructs parents in how to draft an individual education plan that is rooted and grounded in scripture. Other titles concerning reading instruction for the struggling learner have also been added. We hope that you will take the time to visit our online store and check out all the resources that are available. Here’s an easy link to the bookstore, so you can do just that! Thanks Krisa! There isn’t a link to the bookstore that I see…..I know someone who knows Joyce Herzog and has been recommending her books to me, and the other books look amazing as well.